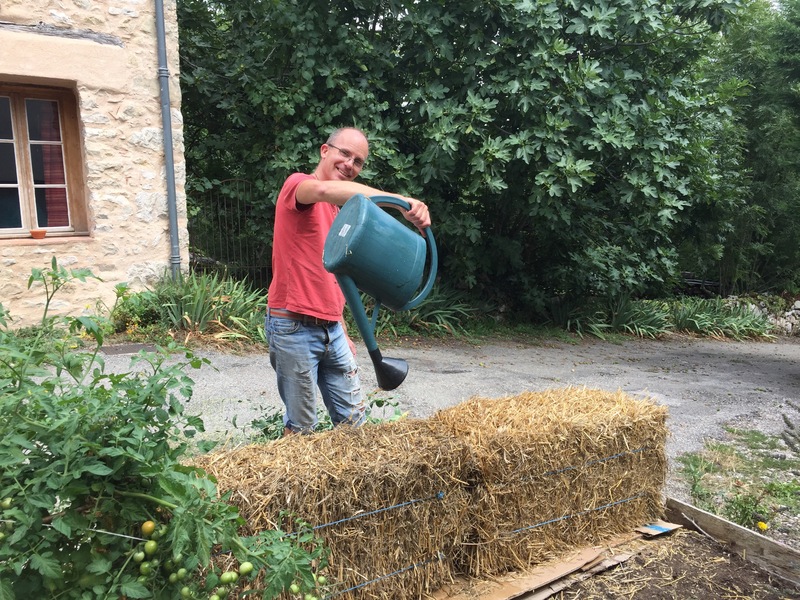 Over the last few days we’ve been busy in the garden setting up a new project, which is to grow veg in straw bales. 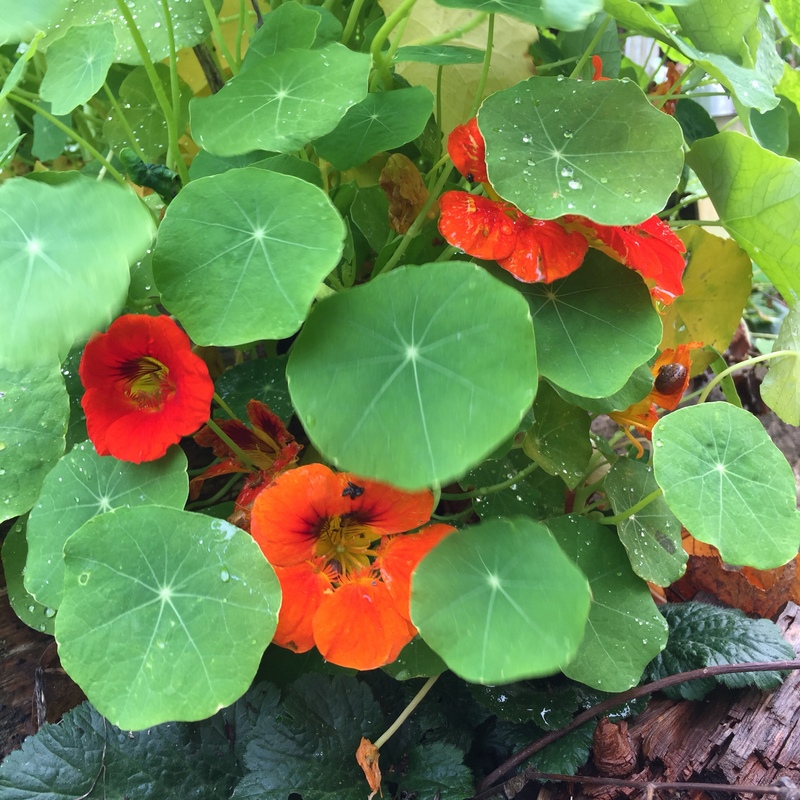 This is a tried and tested method that is growing in popularity owing to it’s simplicity as well as the fact that you can get quite high yields from a small space using less water than in a conventional garden. They’re no good for annual crops, like strawberries or asparagus, as new bales are needed each year, but they’re great for pretty much everything else. As we are short on space and on water, we decided to give it a go. It’s essentially a hydroponics system using straw as the growing medium. As the plants are watered, the straw retains the water as well as releasing nitrogen and generating heat as it decomposes. 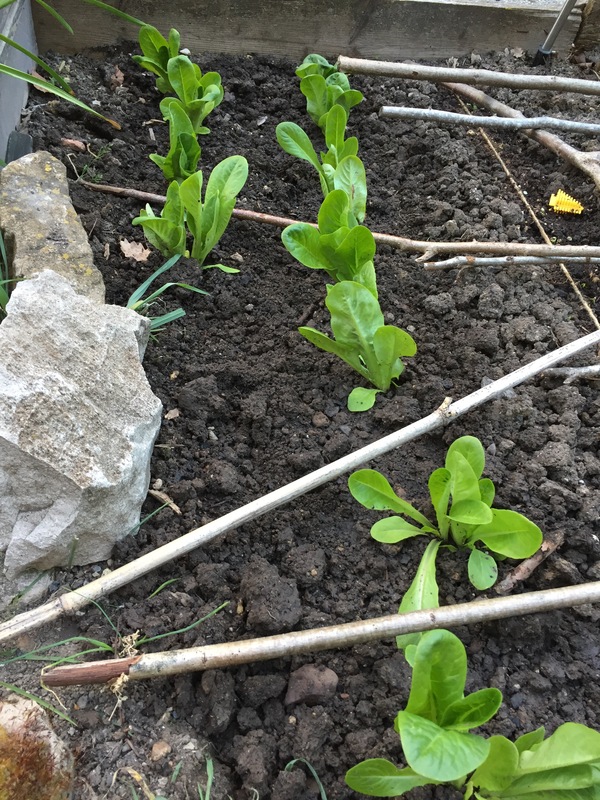 As well as being super-efficient the method also claims to extend the growing season. 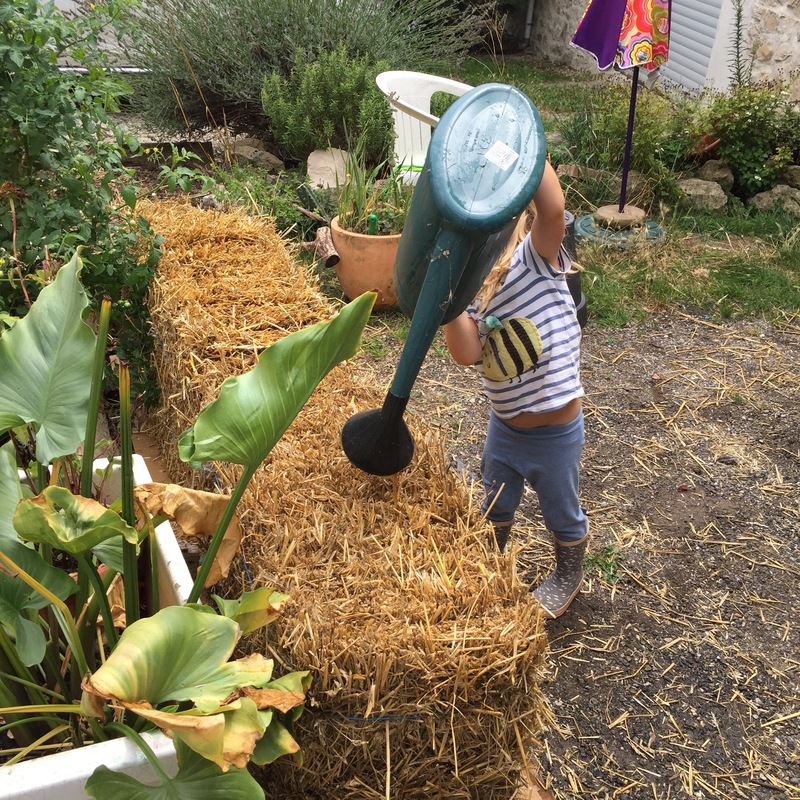 Obviously, James is very excited about our gardening experiment and has been initiating DD in the ways of the straw bale. We hope to build our house with these some day (soon?) and, if this all goes well, we’ll be building our veggie patch with them too! And today I grabbed a few minutes, while DS was pottering around kicking fallen figs down the road, to sort out the seed box (bagging seeds packets by planting month) and sewing some spinach, lamb’s lettuce, radishes and lettuces seeds in the conventional patch, which is now covered up with the netting to try and keep both the cats and birds off. 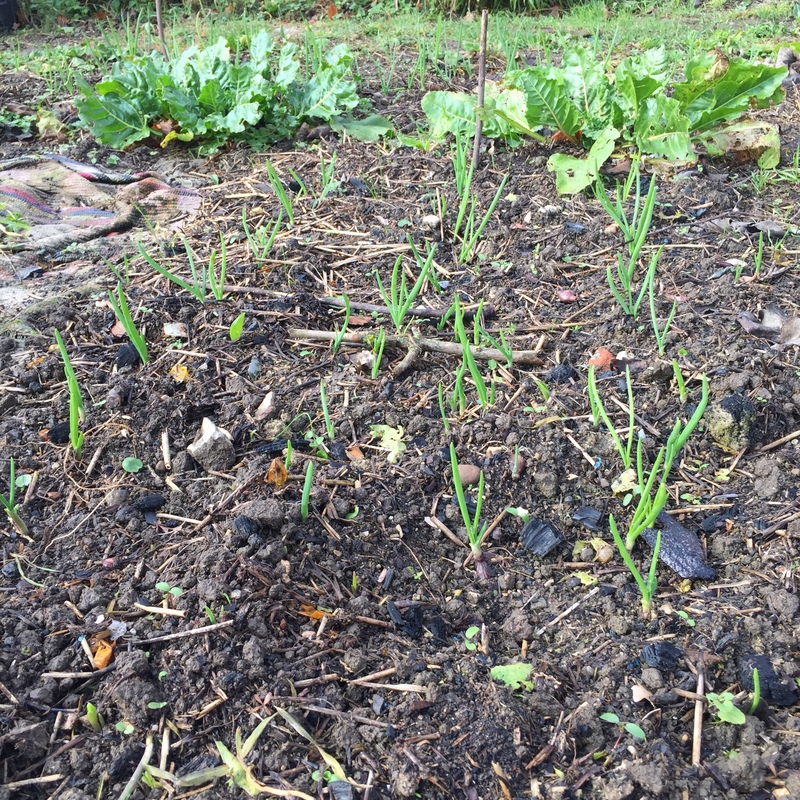 I’m interested to see how these will grow alongside our straw-bale-grown veg, which we can plant in a few days, once the bales have been conditioned, which involves watering them daily and applying a high-nitrogen fertiliser every-other day. All good fun! 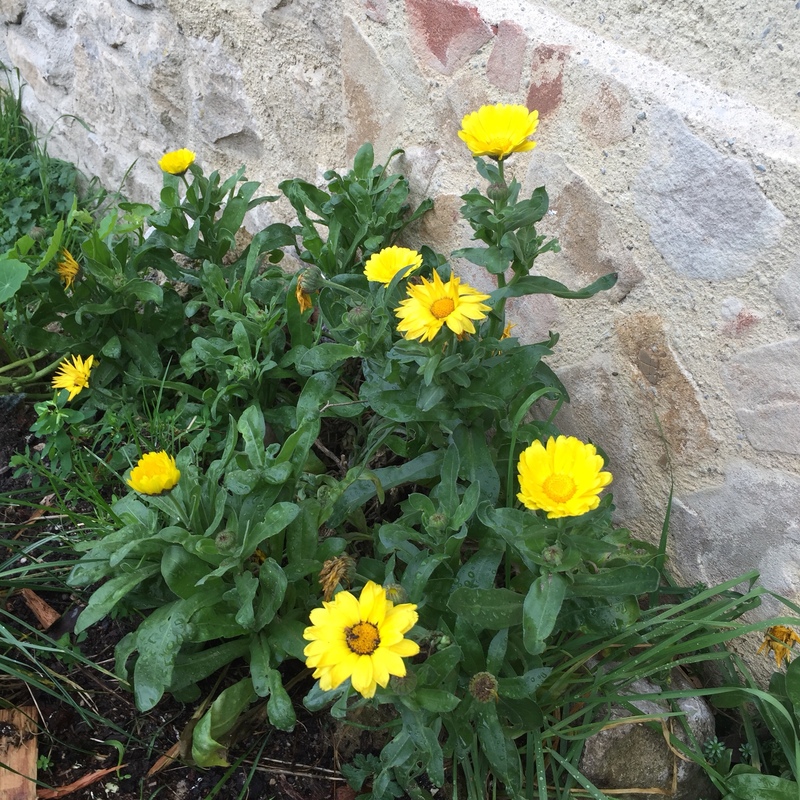 All we need now are a few rainy days to break up the sunny ones and everything should grow nicely. 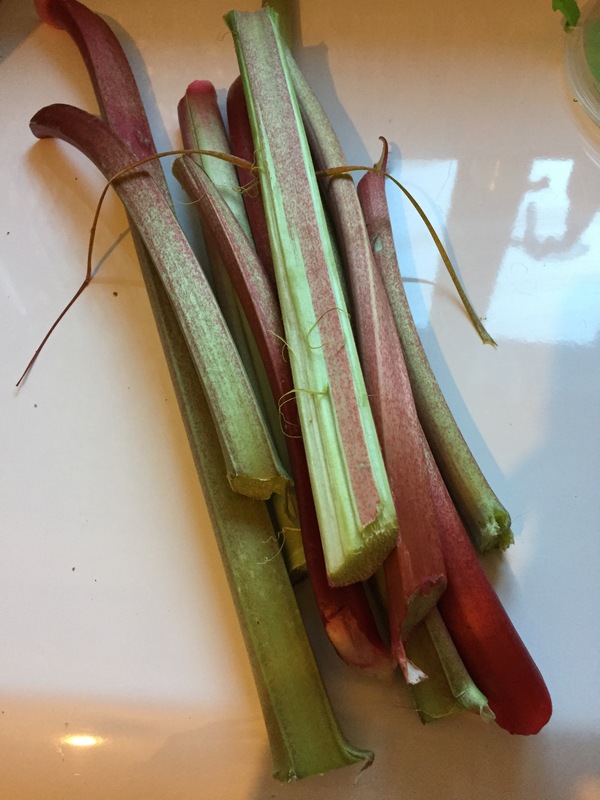 What I really don’t need are any more days where the temperature is pushing 30, as that’s what did for my last crop of leafy veg, which we eat a lot of. 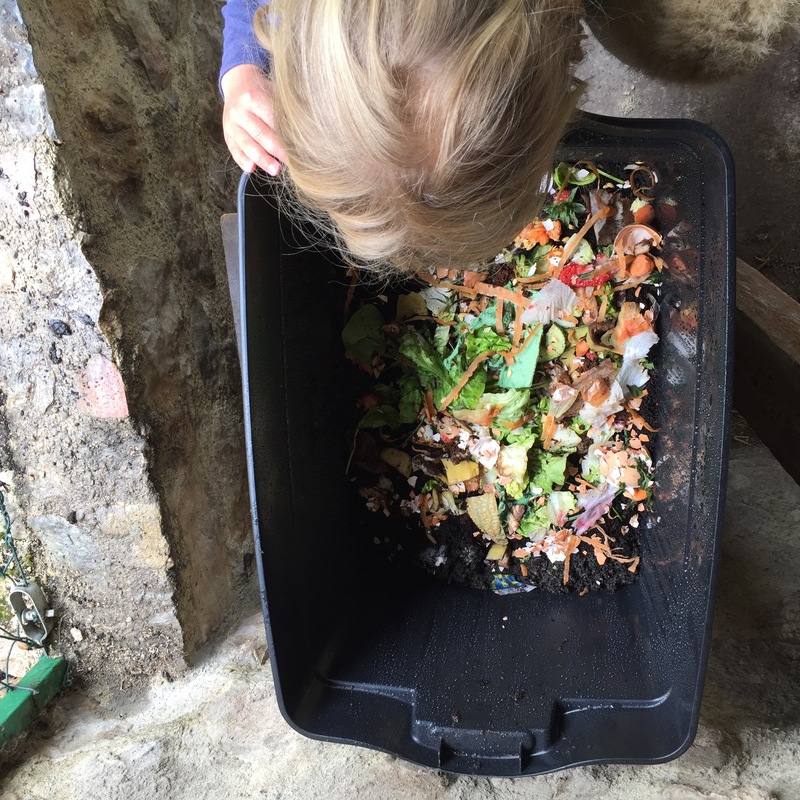 One thing we planned to do but didn’t get around to was sorting out the worm bin, which we’ve been happily chucking our waste into. They seem happy enough but James observed that it’s getting a bit soggy in there so we’ve decided to tip it all out and get the worms set up with some new bedding. That will also give us chance to find out whether our worm community has grown since we last freshened it up. If they’re happy they should have multiplied. If not, well, we’re obviously not doing so well at it and need to try harder. Lots to do! Something that irks about not having our own garden space is not being able to make our own compost. At our last place we donated our food scraps to others’ heaps, which worked out just fine. We thought we’d got a similar arrangement going here but our new neighbour turns out to be a bit fussy about what goes in her heap, accosting me one morning with a list of things that she didn’t want in there, all of which we happily chucked in our compost bins in the past without any issues. From the outset we had a feeling that would happen. You know how some people can be and as lovely as she is it was fairly inevitable that she’d go picking over the compost and find a problem. C’est la vie, as our compatriates like to say. So what to do with our growing mountain of food waste? 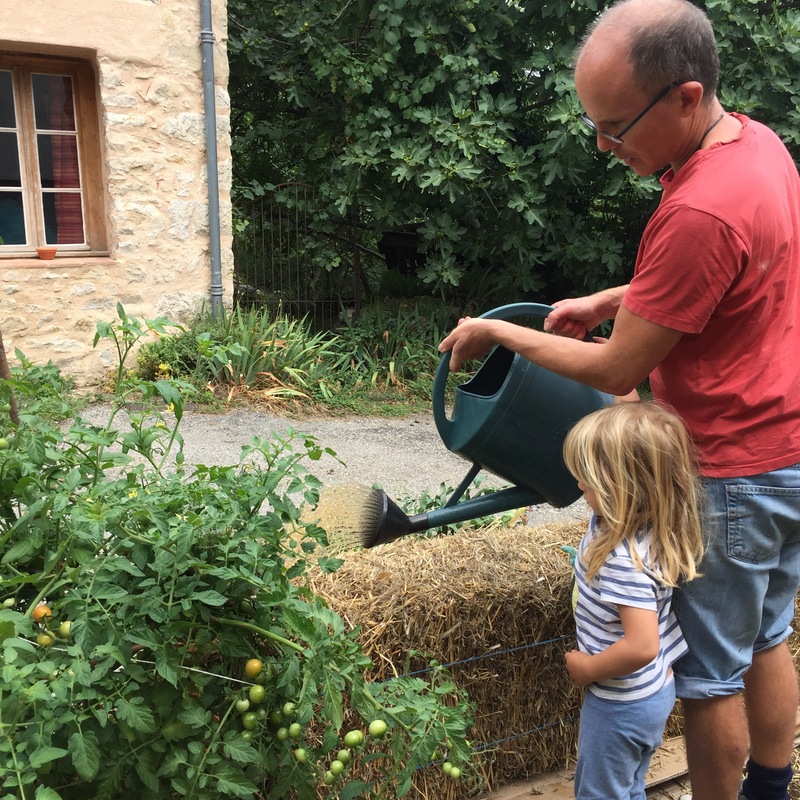 We contemplated a regular compost bin but they seem to retail at around 30€ here. 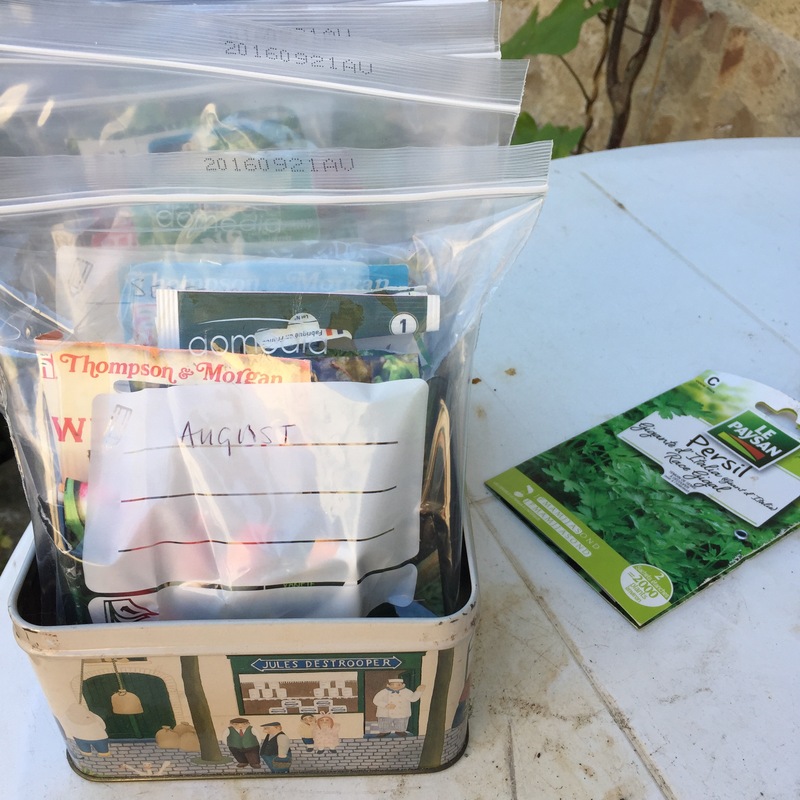 These bins make compost slowly – not always helpful in a rented and (hopefully) fairly temporary house – as well as requiring quite a lot of work and taking up a lot of space – time and space we don’t have. A compost tumbler then? They retail upwards of 80€, so a no go. That’s a lot of bags of compost and the 80€ ones didn’t look great and there was no question of us spending more than that. DIY? We thought that was the best option and even bought a barrel to use but the cost of all the small parts to make the door, the catch, etc came in at nearly 40€ – crazy! Another option bites the dust. That left us with one option: worms! It turns out that composting with worms is actually the best way to turn your old food scraps into garden fertiliser and soil conditioner. In fact, if you are regularly chucking your food scraps into a plastic bin and letting it turn into compost, you are effectively composting with worms because the worms that turn up in compost bins – tiger worms – are the same worms used in most worm composting systems. In the UK our old composter seemed to just get on with it: we’d chuck our food waste in and later in the year it would be gone. We barely got any usable compost out of it but at least it wasn’t in land fill. I presume the worms were eating it! 2 x black plastic containers. We went for the 48 litre ones which are wider and flatter than the 50 litre versions. Something for the lid. Our containers didn’t come with lids so we bought some chip board, enough to make two lids, if we decided to set up an other container. Mesh to cover the base and the ventilation holes. This just stops flies getting in and worms getting out. A tap. This is for the bottom container so that we could drain off the liquid, which is a fantastic plant feed known as “black gold”! We also had to buy a special drill bit so we could fit the tap. It’s a really nice and simple design. The bottom box is used as a reservoir to collect the liquid. The tap just simplifies removing it and isn’t absolutely necessary – a hole in the bottom draining into a cup or jam jar would work just as well. 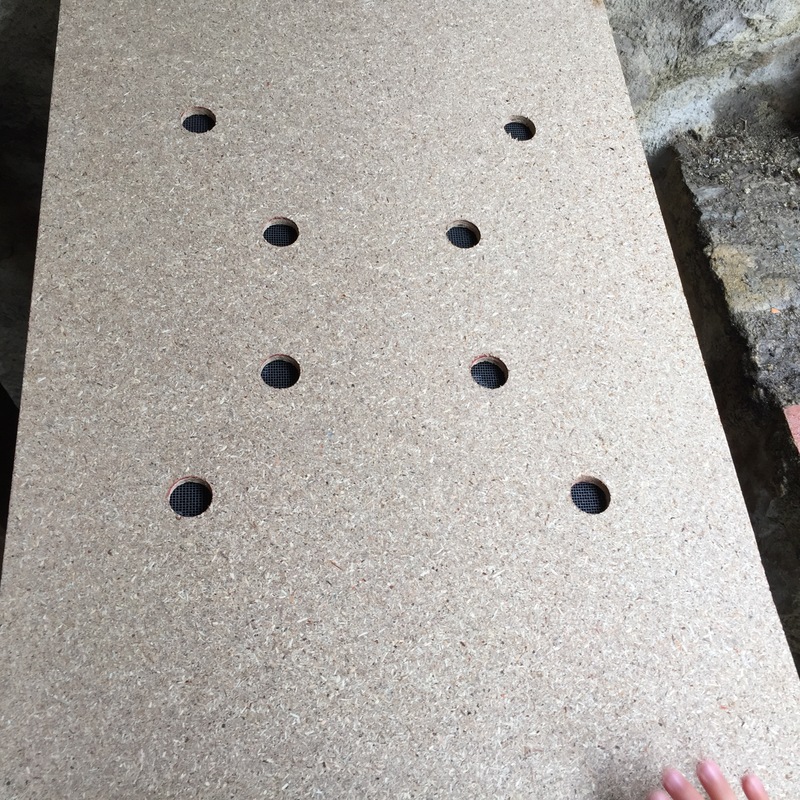 The second box is the worms’ home. 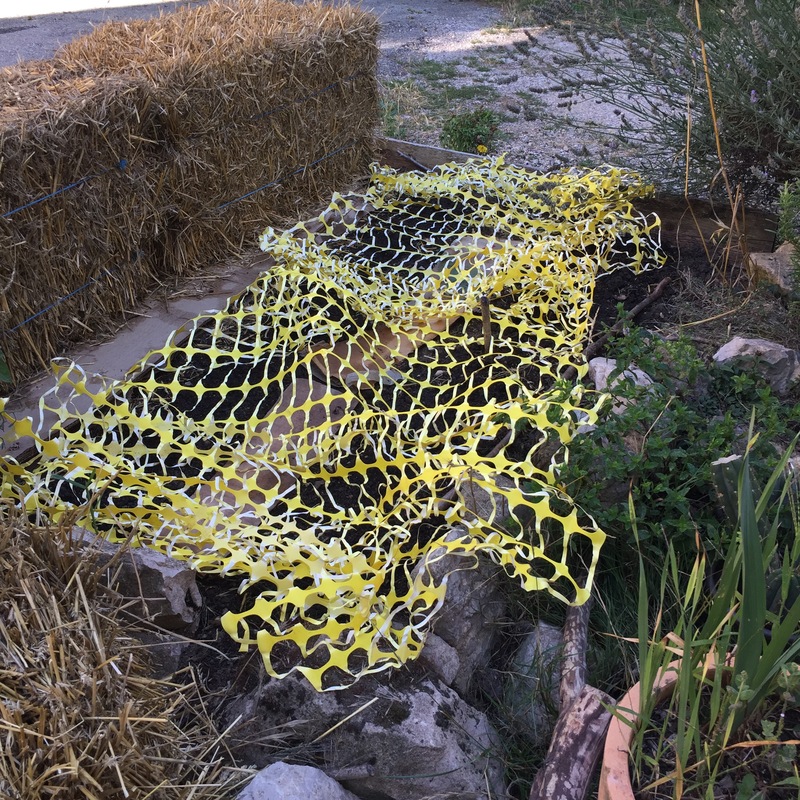 We drilled drainage holes in the bottom then lined it with mesh so that our little wormies don’t fall into the bottom box and drown (that happened a lot with my Can-O-Worms wormery – a tragic as well as stinky thing.) For the lid we drilled more holes and covered them with mesh held down with wood glue. And that’s it. All that was needed then were worms. 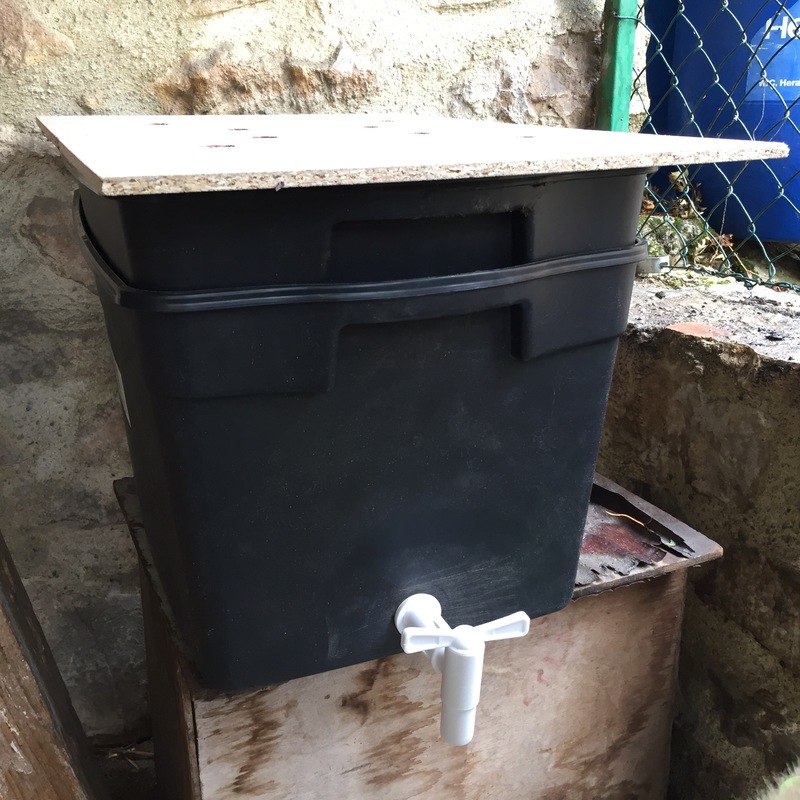 We asked around, posted in a couple of Facebook groups, but ended up buying some from a local fishing shop – another 20€ but we now have a ready-to-go wormery that cost, in all, around 50€ with enough parts left over to make another. We’d need a couple more plastic containers but can transfer worms from this one so the extra cost will be just 12€. For the worms to be happy in their new home they need not just food but also bedding. For this we covered the base of the top bin with a layer of wet paper then put a layer of compost down. The veg scraps then went on top. Internet wisdom generally suggests letting it all get going before piling too much in there so we sprinkled some of the fresher looking scraps on there, gave it a spray with some water to ensure it’s not too dry, closed the lid and left them to get on with it. We did have a bit of shock the next day when it looked like all the worms were trying to escape as they’d congregated at the top of the bin but some Googling later and we’re putting that down to typical worm behaviour, either because they’re in a new home or because it rained through the night. They seem to have settled down again today (Day 3) so perhaps it’s all working just fine. We will see!